Which courses should your student take, and when? 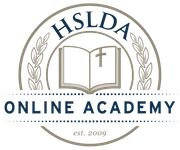 Most HSLDA Online Academy students take 1–3 courses at a time. We list suggested grade levels to help you determine the academic rigor of each course. We leave it up to you, the parent, to decide which courses would best suit your students. Each grade level suggestion is only a recommendation. If you have questions about any course, please contact us at 540-338-8290 or academy@hslda.org.